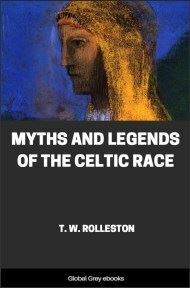 Thomas William Hazen Rolleston wrote "Myths and Legends of the Celtic Race" in 1911 in an attempt to revitalize what he felt was a waning appreciation for the heritage of all Celtic peoples. 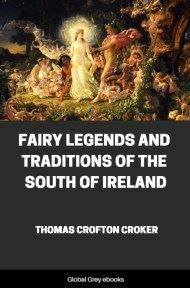 Perhaps the best representation and description of all the legends, myths and spiritual histories of Ireland, Britain and Wales, this collection includes the stories of Ultonian and Ossianic cycles, the voyage of Maeldum, and the myths and tales of the Cymry (Welsh). 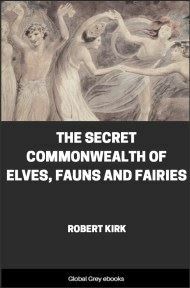 In the chronicles of the classical nations for about five hundred years previous to the Christian era there are frequent references to a people associated with these nations, sometimes in peace, sometimes in war, and evidently occupying a position of great strength and influence in the Terra Incognita of Mid-Europe. This people is called by the Greeks the Hyperboreans or Celts, the latter term being first found in the geographer Hecatæsus, about 500 B.C. Herodotus, about half a century later, speaks of the Celts as dwelling “beyond the pillars of Hercules”—i.e., in Spain—and also of the Danube as rising in their country. Aristotle knew that they dwelt “beyond Spain,” that they had captured Rome, and that they set great store by warlike power. References other than geographical are occasionally met with even in early writers. Hellanicus of Lesbos, an historian of the fifth century B.C., describes the Celts as practising justice and righteousness. Ephorus, about 350 B.C., has three lines of verse about the Celts in which they are described as using “the same customs as the Greeks”—whatever that may mean—and being on the friendliest terms with that people, who established guest friendships among them. Plato, however, in the “Laws,” classes the Celts among the races who are drunken and combative, and much barbarity is attributed to them on the occasion of their irruption into Greece and the sacking of Delphi in the year 273 B.C. Their attack on Rome and the sacking of that city by them about a century earlier is one of the landmarks of ancient history. The history of this people during the time when they were the dominant power in Mid-Europe has to be divined or reconstructed from scattered references, and from accounts of episodes in their dealings with Greece and Rome, very much as the figure of a primæval monster is reconstructed by the zoologist from a few fossilised bones. No chronicles of their own have come down to us, no architectural remains have survived; a few coins, and a few ornaments and weapons in bronze decorated with enamel or with subtle and beautiful designs in chased or repoussé work—these, and the names which often cling in strangely altered forms to the places where they dwelt, from the Euxine to the British Islands, are well-nigh all the visible traces which this once mighty power has left us of its civilisation and dominion. Yet from these, and from the accounts of classical writers, much can be deduced with certainty, and much more can be conjectured with a very fair measure of probability. The great Celtic scholar whose loss we have recently had to deplore, M. d'Arbois de Jubainville, has, on the available data, drawn a convincing outline of Celtic history for the period prior to their emergence into full historical light with the conquests of Cæsar, and it is this outline of which the main features are reproduced here. To begin with, we must dismiss the idea that Celtica was ever inhabited by a single pure and homogeneous race. The true Celts, if we accept on this point the carefully studied and elaborately argued conclusion of Dr. T. Rice Holmes, supported by the unanimous voice of antiquity, were a tall, fair race, warlike and masterful, whose place of origin (as far as we can trace them) was somewhere about the sources of the Danube, and who spread their dominion both by conquest and by peaceful infiltration over Mid-Europe, Gaul, Spain, and the British Islands. 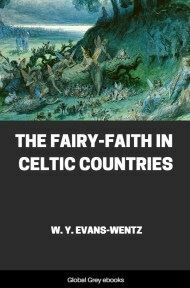 They did not exterminate the original prehistoric inhabitants of these regions—palæolithic and neolithic races, dolmen-builders and workers in bronze—but they imposed on them their language, their arts, and their traditions, taking, no doubt, a good deal from them in return, especially, as we shall see, in the important matter of religion. 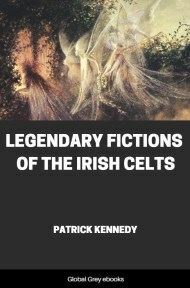 Among these races the true Celts formed an aristocratic and ruling caste. In that capacity they stood, alike in Gaul, in Spain, in Britain, and in Ireland, in the forefront or armed opposition to foreign invasion. They bore the worst brunt of war, of confiscations, and of banishment. They never lacked valour, but they were not strong enough or united enough to prevail, and they perished in far greater proportion than the earlier populations whom they had themselves subjugated. But they disappeared also by mingling their blood with these inhabitants, whom they impregnated with many of their own noble and virile qualities. Hence it comes that the characteristics of the peoples called Celtic in the present day, and who carry on the Celtic tradition and language, are in some respects so different from those of the Celts of classical history and the Celts who produced the literature and art of ancient Ireland, and in others so strikingly similar. To take a physical characteristic alone, the more Celtic districts of the British Islands are at present marked by darkness of complexion, hair, etc. They are not very dark, but they are darker than the rest of the kingdom. But the true Celts were certainly fair. Even the Irish Celts of the twelfth century are described by Giraldus Cambrensis as a fair race.